This house was built using Tech-Wood's WPC siding, developed in cooperation with extruder manufacturer Cincinnati Extrusion. The 'simply housing' concept enables the quick construction of complete houses from WPC kits. Extruder technology from Cincinnati Extrusion in Vienna, Austria, was tailored to produce WPC components with virgin polypropylene (PP) having 75% long fibre content. Profiles for load-bearing parts receive additional reinforcement with metal or fibreglass inserts to counteract plastic flow and increase rigidity, explains the extruder manufacturer. Tech-Wood relates that the challenge was to make use of a fast-growing, non-durable wood species, either virgin or scrap, and transform it into a durable wood composite using a recyclable thermoplastic. During the first 3 years of the development, numerous tests were performed to determine the best formulations, extrusion techniques, screw and die designs and methods for fibre drying and fibre orientation. The testing showed that only oriented fibres could provide the high bending stiffness and strength that were needed, says Tech-Wood. Cincinnati Extrusion and Tech-Wood have been collaborating since 2002 in a cooperative agreement to develop WPC technology using Cincinnati’s Fiberex machine series. WPC compounds of up to 85% natural fibre content are possible, notes the company. 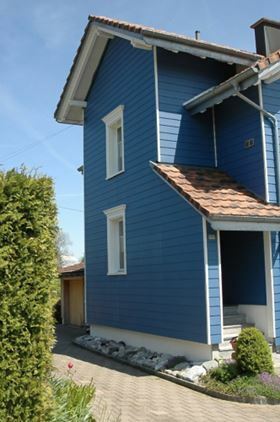 The first Tech-Wood houses have a living area of 85 m2 (919 ft2) and an entry-level price of about €21 000. Licencees purchase the patented technology together with the custom, counter-rotating, twin-screw extruders on an exclusive territory basis.